This waterproof leather utility boot rated to -40F offers 400g of PrimaLoft® Silver synthetic insulation for outstanding warmth and protection in the coldest conditions. The North Face Chilkat 400 Snow Boots‘ impenetrable moisture barrier guarantees dryness and the insulation traps hot air for reduced heat loss and increased warmth. The upper is leather and the lower is waterproof thermoplastic rubber. The TNF Winter Grip outsole and IcePick temperature-sensitive lugs offer excellent traction on ice and snow even without spikes. Finish it with the Northotic 2.0 dual-density midsole for a comfortable, cushiony experience. The upper is waterproof, BLC-compliant full-grain leather that’s lined with 400g PrimaLoft® Silver Eco recycled insulation. The upper is also injection-molded, waterproof TPR shell with rustproof hardware that includes a gaiter-compatible D-ring at the base of the tongue. The bottom has a Northotic 2.0 dual-density footbed with softer heel and forefoot-cushioning pads and a compression-molded EVA midsole. The outsole is made of durable TNF Winter Grip, a rubber compound, with IcePick temperature-sensitive lugs for increased traction. The shaft height is 10 inches from the bottom of the heel to the top of the boot providing warmth and comfort half way up your shin. This also means you could step in 9 inches of water before any leakage would occur. Other reviews that I read about the Chilkat 400 before purchasing my pair indicated the sizing runs small. Recommendations were to go up one full size beyond your usual hiking boot length. My experience was that a half size up was good for me. I wear a size 8.5 trail runner and a size 9 hiking boot. I purchased the Chilkat 400 in size 9.5 and found that to be ideal for me, even with a pair of very heavy merino wool socks. I mention this to suggest that if you choose this snow boot you should probably go up from your normal shoe size. The width seems to me to be normal. It is nice and roomy even with heavy socks. 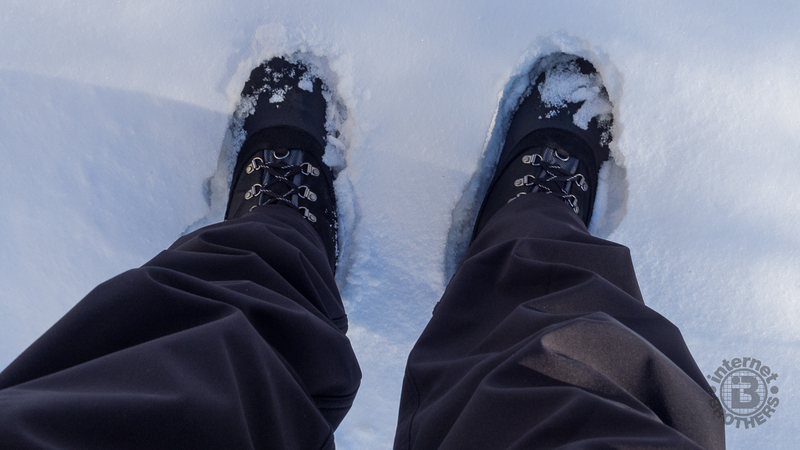 Out in the snow with my North Face Chilkat 400 winter hiking boots. The North Face Chilkat 400 snow boot is a solid, heavy boot. Each boot at size 9 weighs 1 lb. 12 oz. That is hefty. You probably don’t want to wear them for much other than snow utility. I have worn the boots on two hikes, each of five miles. I doubt that I would want to wear them for more than about eight miles. I suspect my feet and lower legs would become weary from the boot weight. Having said that though, the boots are extremely comfortable, did not require any breaking in, were entirely waterproof in 7 inches of snow, kept my feet nice and toasty, and felt as though they will last a very long time. They are solidly made and seem as if they will be quite durable. When standing, the boots have just a touch of a forward lean, so I found myself dragging my heels for the first half mile, or so. Once I got used to picking my feet up a touch higher, everything was fine. I would suggest you wear a boot cut pant to cover the top. Because of the Primaloft padding, a conventional pant leg would not fit down over the top of the boot. The traction is very good. I did not slip at all in snow, even on a 15° pitch. On level ice they also did fine, but I’m not going to try downhill ice in any boot without micro spikes. Call me dumb if you like for hiking in snow and ice, but I wasn’t born yesterday. I don’t have to fall twice to be wary. The upper in this boot is exceptionally soft and flexible. The thick Primaloft padding really makes your feet, ankles, and lower legs very comfortable. Even with the high shaft I didn’t experience any rub on my shins. The gaiter hook at the end of the tongue is a nice touch. The warmth provided by the Chilkat 400 boots is just as advertised. I hiked 5 miles in 7 inches of snow with an air temperature in the teens Fahrenheit, and my feet never even thought about getting cold. Nor did they get too warm. I was wearing a pair of heavy merino wool mountaineering socks inside the boots and did not sweat. Water leaking into a winter boot is obviously a recipe for disaster. While I did not step in any creeks while wearing these boots, the three hours of snow tromping convinced me that these boots are indeed waterproof. I looked at every square millimeter of the boots very closely looking for potential leak points and saw none. As long as you stay out of water that would be deeper than the height of the shaft, your feet will stay dry. The boots aren’t necessarily easy to get on, particularly with gloves, but then what heavy duty snow boot is. As long as I loosened the laces to below the top two eyelets, I was able to slip my feet in fine. The laces themselves are flat, so the tie remained intact unlike some round lace ups that tend to come undone. In conclusion, The North Face Chilkat 400 snow boots are very well suited for winter hiking, with or without snowshoes. They are exceedingly comfortable (REALLY), kept my feet completely warm and dry, and are versatile enough to use for many snow activities. I slipped them on when it was time to shovel my car out of the most recent snow storm. The North Face Chilkat 400 Snow Boots retail for US$150.00 and can be purchased online directly from The North Face or from Backcountry.com. They come in two colors, Demitasse Brown and Dark Shadow Grey. In both cases the lower rubberized portion is TNF black. After I have worn these boots for a year or more, I will come back here and report about their durability.